ESSENTIALISM by Greg McKeown is a book that should be read annually. In it we are asked, “What if we stopped celebrating being busy as a measurement of importance?” Not that it is a new concept, but it is a book that assembles all the great philosophies and thinkers into a cohesive and inspiring format. McKeown starts from Socrates (“Beware of the barrenness of a busy life”) and works his way into modern thinkers such as Drucker, Gladwell, and Csikszentmihalyi. 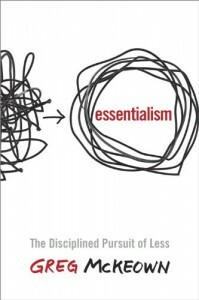 McKeown makes the concession that essentialism is “not about eschewing e-mail or disconnecting from the Web or living like a hermit.” It’s about finding—get ready for it—what is essential. He includes a drawing to help illustrate this: on one side is a circle with several small arrows coming out of it; on the other side is a circle with one long arrow. Picture it. We have so much resource, so much time, so much energy. The less we are committed to, the more successful we become in our task. McKeown points out that the word “priority” didn’t have a pluralization until the 20th century. I’m reminded a lot of last year’s book GETTING TO IT! by Jones Loflin and Todd Musig. In it, the authors talked about using a filter for your time. One of those filters being the ability to say “no”. Here, McKeown describes how to fulfil your “no” repertoire and filter through the opportunities that we are given as our success increases. McKeown emphasizes the continuous analysis of: explore, eliminate, and execute. Like those before him, no good personal success book would is complete without a metaphor. Here, the metaphor is cleaning your closet. There are always trade-offs in cultivating the essential. In your closet, instead of asking yourself if you should get rid of something, ask “If I didn’t already own this, how much would I spend to buy it?” In your closet of life and time, when an opportunity presents itself, McKeown encourages you to question each new opportunity. This book is not a one-trick pony. It is a singular, life-changing concept that presents a “massive shift in thinking”. Page-edge to page-edge is filled with quotes and references used in context as a toolbox offering to help shift our thought from busywork=success to the new paradigm of concerted effort=success. For the references, journal entries, and scientific studies that don’t fit within the pages, there are a plethora of footnotes for further reading. I’ll list some of the other books the author quotes below, but one of the more enlightening ones that stands out is a reference to the study about the 10,000 hour rule, most famously known in Malcom Gladwell’s OUTLIERS. It says if you put in time, you’ll be an expert. Another finding from that same study shows that over eight hours of sleep was also a contributing factor. This illustrates the paradox that expertise isn’t just about putting in the hours, but rest and focus are nearly equal contributors. The bottom line is that I love this book and books like this. It contains interesting, forward-thinking thought presented in a new light. It contains lots of references to already established material from well-researched authors. It’s not just a collection of quotes, but an assembly of ideas, drawings, charts, and other helpful learning materials. In other words, practice what you read in this book and your life is guaranteed to improve. Read it again next year and you’ll learn something new.